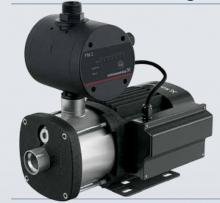 The Grundfos CM Booster Self-Priming is a compact booster pump designed for domestic and light industrial use. The booster unit consists of a robust multistage centrifugal pump and a generator friendly PM1 or PM2 Pressure Manager.The Pressure Manager allows the pump to startand stop automatically according to demand andprotects the pump from dry running. The CM Booster Self-Priming is the perfect solution if you are struggling with insufficient mains pressure,and can also be used with above or below groundwater sources.